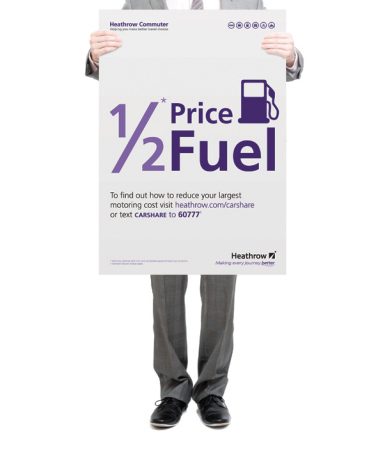 Heathrow Commuter, Heathrow Airport’s sustainable travel team, launched a car share campaign in March promoting ‘Half Price Fuel’. Heathrow has the largest car share scheme in Europe but still find that a savings message is the most affective way to generate awareness and recall amongst the 76,000 employees who are the potential target. Our challenge was not only to come up with a memorable way of communicating ‘Half Price Fuel’ but to roll the concept out across lots of other mediums that would help to generate registrations to the scheme. Our approach focused on creating a headline and graphic that worked like an illustration, it gave us a presence in print that we were able to scale up and down for online promotions on intranets, screens and emails and ultimately at registration events in the four terminals, which resulted in just over 500 employees joining the scheme that month. We also launched a new call to action through this campaign – a text service. Monitoring responses will help to establish a preference for getting in touch for the next one. We have recently completed the design and artwork of PTS’ (Plumbing Trade Supplies) ‘Bathrooms 2011’ brochure. 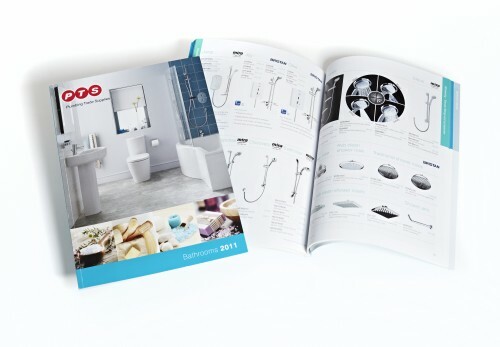 This is the 3rd year we have produced this successful brochure showcasing the latest range of bathrooms and accessories available across all 300+ PTS branches. We developed a fresh, contemporary design for the A4 brochure, aimed at the end-user, that effectively positions PTS as one of the leading distributors of plumbing, heating and sanitaryware in the UK. The 2011 brochure now includes prices for all products too. We have already received very positive feedback from the client and we are very proud of the finished product – an attractive and user friendly piece of sales collateral.